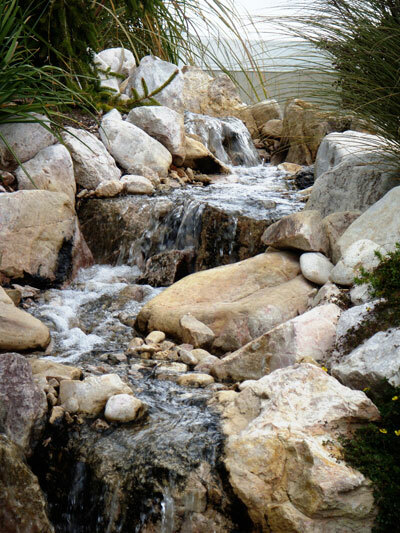 Enjoy a narrow garden stream that is long enough to have a gradual bend or two. Perfect for moderate slopes and smaller scale landscapes. Vertical Drop is the combined height of the system's waterfalls. For example if the system has four two foot waterfalls the total vertical drop would be 8 feet. The length of liner included with each kit is longer than the stream to account for vertical drop and turns in the stream channel. The stream width of 1-1/2 feet mentioned above is the width of the stream channel before adding rock. The gravel depth over the liner is based on 1-1/2 inch of gravel over the bottom of the liner. The depth of water over the gravel will be approximately 3/4 of an inch. 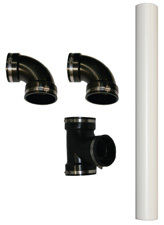 A valve to adjust water flow is included with each kit. The above photo is an example of a system built by a Berkey Supply Customer using the components included in the Springbrook 2-WS System. water feature Need Some Design Inspiration? 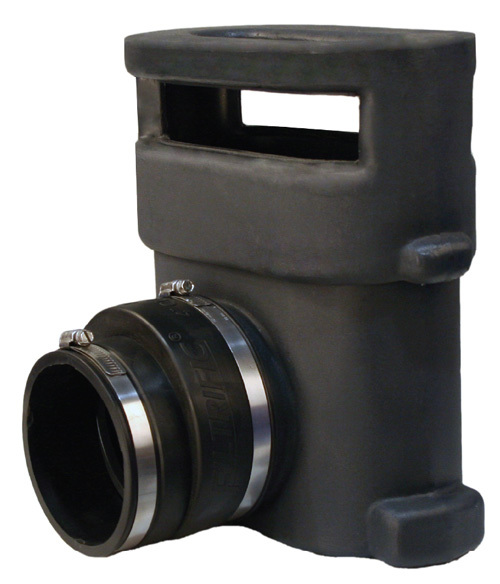 Protects against debris buildup and clogging, filters include solid bottom to catch silt and very fine debris. None. 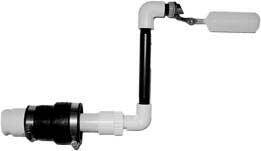 Allows for the system to be cleaned without removing a portion of the reservoir. None. Other systems rely on rocks for filtration which must be removed and washed. Hardware is easy to access in the event of malfunction or other service. Reservoir must be partially removed to access hardware. 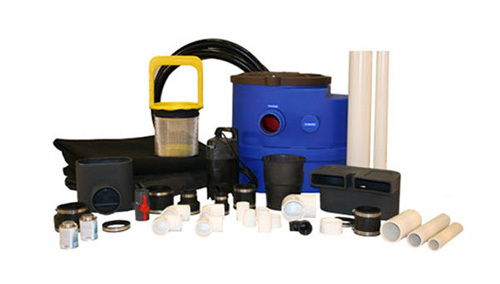 Filtration, Pumping Accessories and Reservoir is combined in one unit. Provides for a small footprint in the landscape and fits where space is limited. Components are housed in separate units which must be disguised into the landscape and require a large footprint. Resists puncture from debris and sharp objects. A thin, rubber lined reservoir which cannot be inspected. Provides the option of incorporating a wet finish into the water feature for a more natural look than water falling into a bed of rocks. No wet finish option. The water must fall directly into a bed of rocks for a very artificial look. The liner and underlayment lengths included in Berkey Waterfall & Stream Kits is completely for use in the waterfall and stream area. None of the liner or underlayment is required to be devoted to the reservoir as with other systems. Adds water to the system when the water dips below a pre-determined level. Attaches to a zone on the landscape irrigation system. Shuts off the pump if the water level drops too low. Prevents pump burnout. Allows for large rocks and natural elements to be placed on top of the Fixed Skimmer. 40 Gallon Expansion Reservoir. For use with the T40F & T75F Filter Tank Reservoir. Requires either RC-44LL or RC-44LTL Connection Fittings. Connects (1) T40SP Expansion Reservoir to the T40F or T75F Filter Tank Reservoir. Connects (2) T40SP Expansion Reservoirs to the T40F or T75F Filter Tank Reservoir.